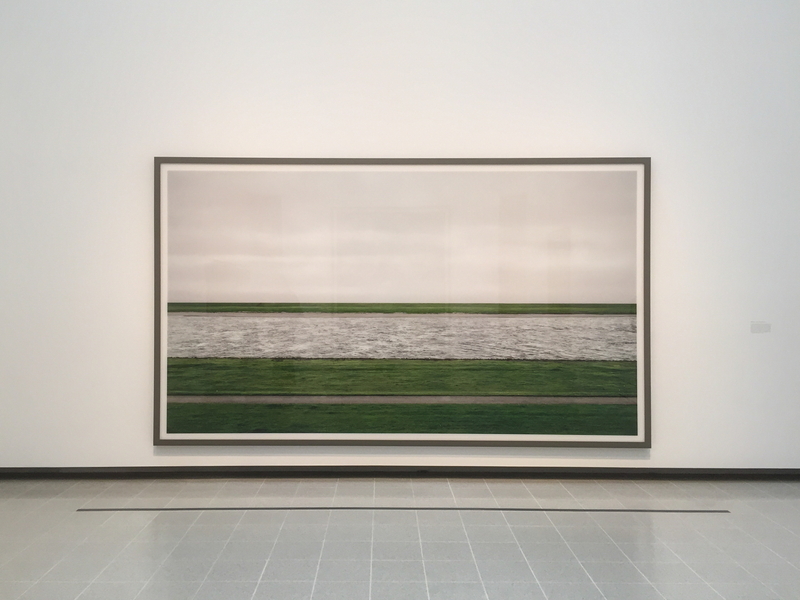 Over the past 10 to 15 years I have repeatedly seen some of Andreas Gursky’s better-known images in the photography media and been unable to engage with them, partly because I was aware of the fact that there are varying degrees of manipulation in them. I have tended to find obviously manipulated images of most kinds relatively uninteresting. 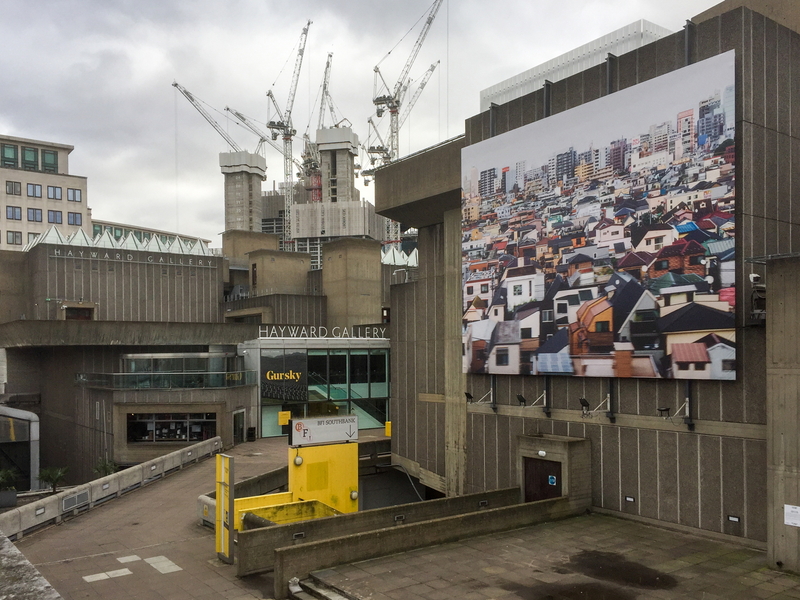 On Friday last I had to be in London for a conference, but my morning was free, so I booked online and went along to see if I reacted differently to the things themselves, in full size, at the Hayward Gallery. 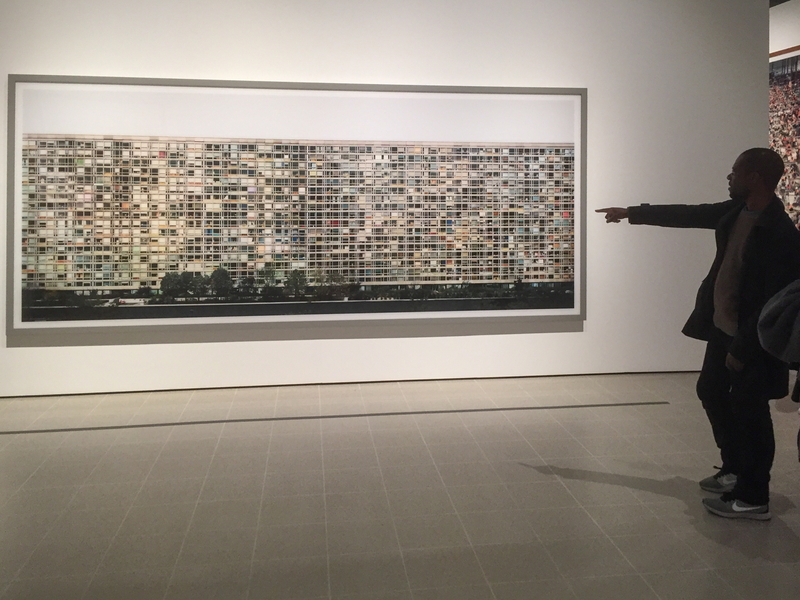 The exhibition is a fairly full retrospective with 68 images on show, of various sizes, displaying Gursky’s range of image making subject and presentation decisions over the past 30 years. The development of his thinking and techniques is well documented in the statements and individual image captions that accompany the images, without them becoming overly international artspeak, academic or long. It would be easy to say that the early work presaged the final destinations, and in some senses it does – the development of a more distant view of landscape that encompasses more detail and includes people, the interest in masses of data in complex scenes. But the eventual arrival at the large-scale, reworked imagery, has taken his work to another dimension that I found I engaged with very strongly. This was unexpected for me, and I understand that some people feel it is on a par with their engagement with Rothko’s large scale canvases, which I experienced myself in the Rothko Chapel and Menil Museum in Houston, but didn’t connect with, 15 years ago. Probably it’s me that’s changed in the interim – there were some strong echoes of my own journey in photography, though nowhere near as deep and prolonged as Gursky’s. The early work – exploration of the social uses of landscape – is a common interest for me and I would like to have seen more than the small selection that is in the show (if there are more in the projects that Gursky did). My response to “Rhine II” (see image at the top of this article) was less a rationalization than an acceptance that the deliberate removal of detail had created something that at the same time engaged me thinking about the essence of the landscape, but also gives an increased awareness of what we do to the landscape when we install all our activity and industry and wealth extraction mechanisms on it. The photographic material technical and editorial fictionalizing enables the contemplation of the essence of what was there first. I think that this is what Gursky may mean when he says: “I am interested in the ideal typical approximation of everyday phenomena – in creating the essence of reality.” Imagining what has been taken out in looking at an image, for instance Rhine II, helped think about what has been left in the image means, represents and allowing myself a subjective response to that and what it feels like. I found that I could look at this image for a long time. By contrast, in “Tokyo, 2017”, displayed both inside and outside the gallery (above), I found a serendipity connection with photos that I had made on way into London on the train that morning. I had realized that the view from the train track was a different set of data of what peoples’ lives look like – the backs of their houses, the back yards of their businesses – a more private, slightly voyeuristic, view, rather than the more tidy and restrained one you get from the normally seen street view of the “front of the house” view of their lives, whether personal or commercial (see my image below). 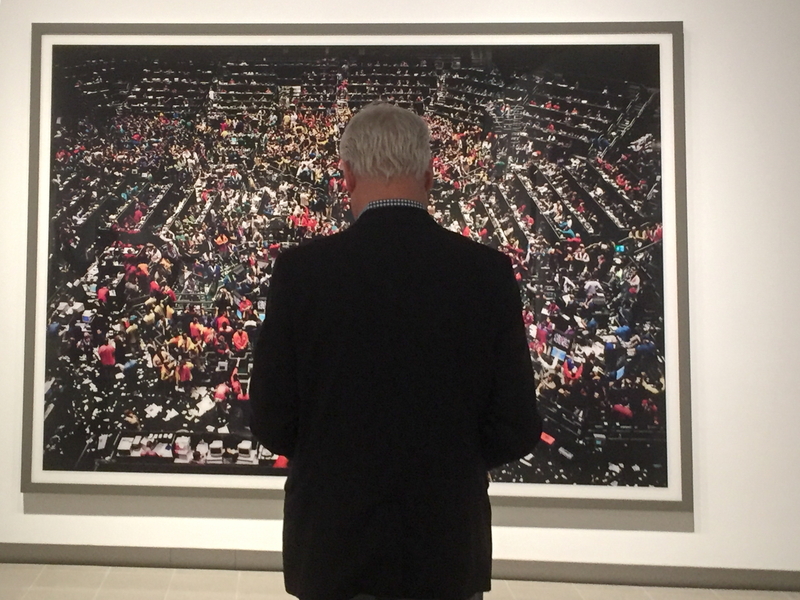 When I got to the Hayward I found that Gursky had been exploring the same issues, in 2017, of how to show the complex of multiple impressions that you see from a moving train or car, and how you might capture and present that to see what we can learn and understand of the complexity that we see. His response to the technical issues was to accept the possible out of focus blur as a part of the consideration, but he has stitched together many images of the same scene to achieve a new fiction in which “Gursky has described the relationship between construction, documentation and authenticity in his work as similar to the way that we might recall a landscape glimpsed from a moving vehicle”. You get an impression, not a detailed image in sharp focus. His more blurred work, “Utah, 2017”, makes this point better in my view, and is indeed more “cinematic”, as the caption describes it, than the more static feeling blur of “Tokyo, 2017”. The day before I went to the exhibition, I was at a lecture on the financial services industry and in particular the view that the City of London is a an offshore tax haven for all the dirty money from the rest of the world and a sector that does not create wealth, but leeches it out of all the other commercial activities it touches. So Gursky’s complex images of an Amazon warehouse, a 99 Cent supermarket, the Tokyo Stock Exchange and the Chicago Commodities Exchange had resonances for me with the complex activities of those enterprises and the fact that the vast majority of the world have no idea how they really work and the inconceivable amounts of money they make for their major stakeholders. The details of course, can be telling. For instance in the Amazon warehouse image – where they have slogans of inducement to the workers on the warehouse pillars – “WORK HARD” “HAVE FUN” “MAKE HISTORY’ – that have chilling echoes of another “systematic” approach to the uses of humanity. 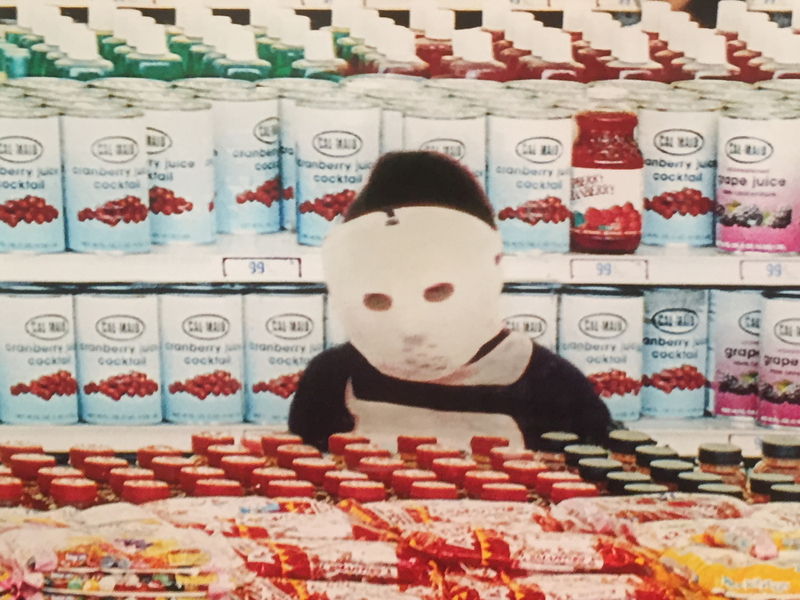 In the 99 Cent supermarket image there is a person between the aisles in a mask like the ones used by the Occupy movement members. Go find these details for yourself. For me the main images caused me to think about the conflicts between perfection and reality; the conflicts between social organization, industry and humanity. About the reality of what something is rather than what it forensically looks like in a traditional photograph. And about the fact and fiction debate; whether docu-fiction is no less a narrative about what it is to be human and exist in our world and the idea that a fictional construct can demonstrate the core characteristics of a reality that a stringently factual and “accurate” portrayal may not. The work is also about the patterns and ruts of our lives that cannot be clearly seen when viewed close up, or indeed in the more distant perspectives that we are used to as our brain interprets what our eyes see, or with the particular perspective distortions of the cameras that we are used to using to memorise the world we have experienced. So is what Gursky’s images are showing us, the complexity of modern life as portrayed in the massive tsunami of visual data that hits us daily, and what kind of narrative that we take on board from it of our part in all that, and so what it might mean for us in how we construct what purpose we can from it? For me it is that, rather than about the endlessly repeated questions of the nature of photography and the photographic document. I could go on writing about this exhibition for pages and pages and pages. I may well go back for a second viewing. Go and book yourself in soon. I was fortunate that the timing of my ticket was immediately after opening, and there were therefore fewer people before me as I walked around the show, so I got several minutes with each image uninterrupted by others in the way. This did make a difference for me, especially with the large pieces, as I found it best to view them from 15-20 ft distance. I went to the Deutsche Bourse Prize show at the Photographers Gallery and was blown away by the large format prints in Dana Lixenberg’s “Imperial Courts” project. I thought it by far the strongest work in the shortlist and was very pleasantly surprised when it was selected as the winner. 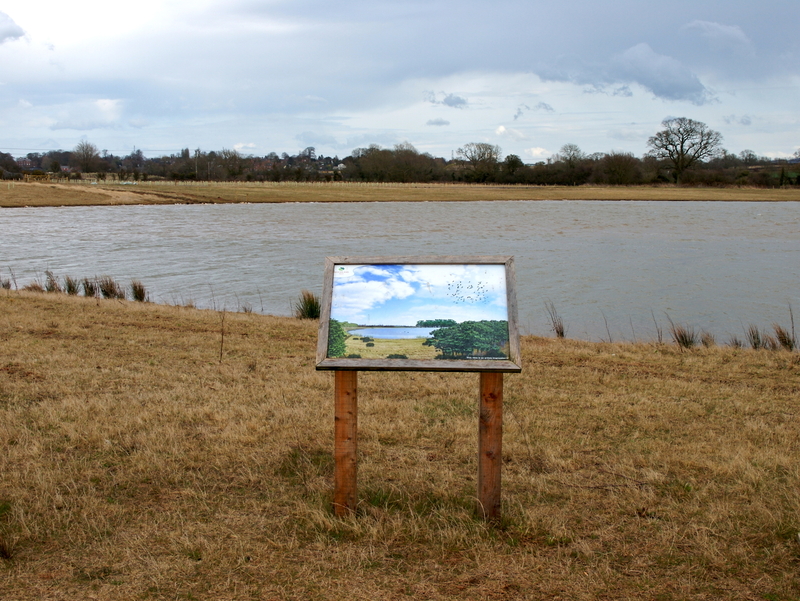 Simon Roberts’ “Merrie Albion” is a demonstration not only of superb technique, particulary point of view and breadth of vision, but also a deep understanding of how the British psyche plays to the landscape, and the current tensions within our society. I have been tracking Jim Mortram’s work for a few years and was delighted to have the opportunity to back this important photobook project on Kickstarter. The brilliantly titled “Small Town Inertia” was justifiably one of Kickstarter’s fastest fund raises of the year at 8 hours. 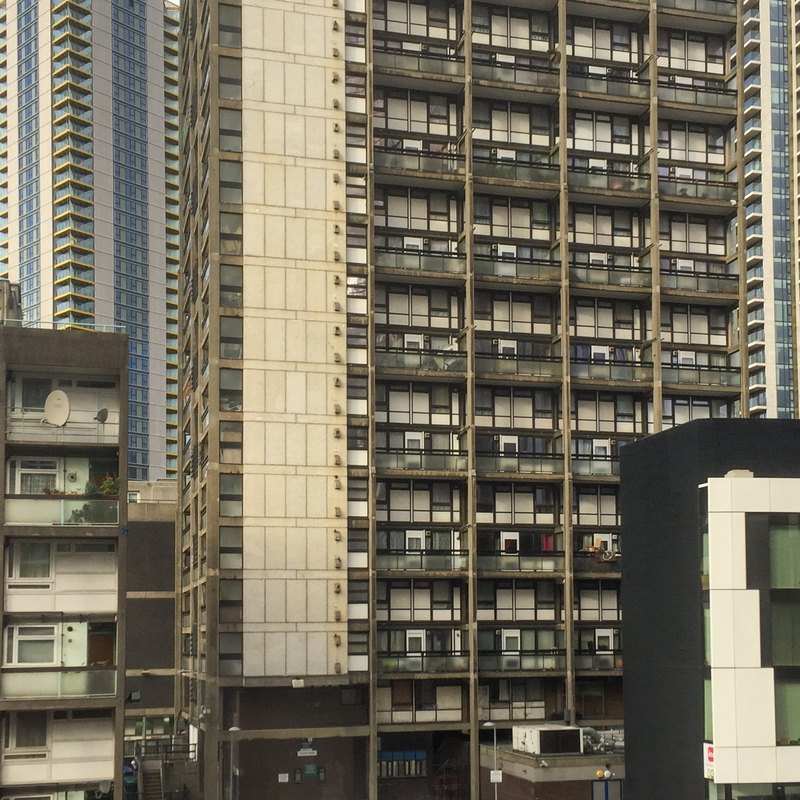 It is saying something from a deeply personal long term experience point of view about the priorities of our politicians over the past seven years and the effects they have had on the most vulnerable members of our society. Richard Mosse’s earlier work left me rather cold, as I felt that it was all concept and little content. The book “Incoming” however, moved me as the previous work hadn’t, and I go back to it frequently to get more from the impression it leaves, either as you flick through, or by engaging more intensely with a small group of the images at a time. Also about refugees, Marco Tiberio’s little estate agent like brochure “IMMO Refugee”, displaying available and desirable “properties” in Calais for people from many lands, was a great find at the photobook fair at Derby Format Photography Festival this year. My friend Adriana Groisman’s massive “Voices of the Tempest” arrived early in 2017 and was the subject of another crowdfunding, raising a huge amount of money to produce this weighty tome, about a weighty subject. The juxtaposition of images of the Falklands/Malvinas landscapes with the portraits and stories from participants from both sides’ militaries is very powerful and moving indeed. It shows what humans fight over and the results of that predilection in sad detail. By contrast, at the estimable Brighton based “Miniclick” photography group, I was introduced to Sian Davey’s delightful book “Looking for Alice”, about her Downs syndrome challenged daughter. This is a testament to the love that happens when parents have an atypical child and love him or her the more because of what they learn together about what it is to be human. Of course this is very close to home for me, as my own daughter Emily is autistic, and this year has been challenging for us in finally getting the state to fund an appropriate college placement, now that she is a young woman of 20. In a sense this issue, and those of the Mortram and Mosse and Lixenberg and Tiberio books, all tie in to the final book that I got this year – Matthew Smith’s “Exist to Resist”, which is a review of 30 years of protest and resistance to right wing goverment policy through the festival/subculture scene in the UK. It seems that governments do not naturally do the right thing; politicians wait until things are so bad and broken that they have to respond, or start to have serious social unrest. Governments are also open to constant pressure from business interests, whether legal or not, as is depressingly well reported in Alejandro Cartgena’s little handbook, “A Guide to Infrastructure and Corruption”. This shows not just the results in Mexico of the direction of public money to unnecessary, unfinished and ill thought out infrastructure projects, but also, in the little appendix in the inserted booklet, the human tragedy of the responses to those who do push back against this process. In 1982 I spent several months in China, when it was very closed to visitors and an alien society, which I documented in my first real photographic project. I spent some time in Chongqing, one of the cities that is now a huge megacity in the new China; so the lovely images in Maciej Leszczynski’s little book “City of Rivers” had an interest and appeal for me that was especially personal. I photographed some of these places 35 years ago. The joy of a small, very reasonably priced, book’s success in showing what would normally be printed as large as possible is one of the pleasures that I have had this year. Not all my book purchases are new books; some are what we now try to think of as “pre-loved”. In contrast to “City of Rivers”, another view of man’s effect on the landscape, a particular concern of mine for some time, was in finding Simon Burch’s thoughtful book “Under a Grey Sky”, about the peat cutting fields in Ireland, as they closed down in response to falling demand. Sadly this came to me through the sale of Sue Steward’s book collection, after she died this year, and the book is more poignant for having a few little PostIts marking the images that she particularly responded to herself. Lastly, in May I was very lucky to find myself on holiday in Barcelona when the amazing “Photobook Phenomenon” exhibition was on. Fortunately I was able to go back not just once, but twice, to fully take in the astonishingly well curated homage to the photobook, aptly much of it in a church-like cloister environment, that revered some of the icons of the genre, from some of the most important photobook collectors and photographers of the past 150 years. The catalogue is itself innovative and creative in its presentation of some of the concepts that the exhibition displayed and is well worth getting hold of if you are at all interested in the history and development of photobooks. 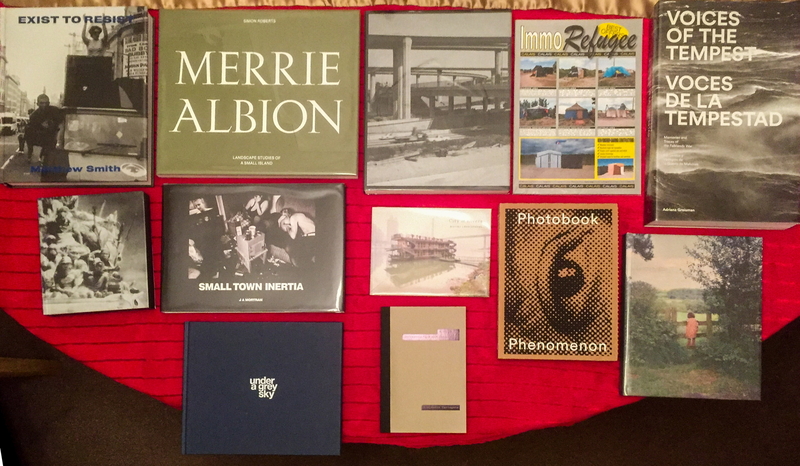 So my list of photobooks of 2017 is more a personal response to things that I have acquired in 2017, than an attempt to define the highlights of the photobook cannon. The context of my acquisitions includes our move to Brighton, where we are now settled very happily, although this has necessitated my culling my photobook collection by about half in physical terms – there will be an announcement of the auction catalogues in the New Year. Brighton has a lively and interesting photography scene and I have met some old friends again and am making many new ones. This is where I now hope to be able to do more, both with my personal photography projects, and in working with others on subjects where photography has the chance to make a difference to the world. Have a great New Year in 2018. It’s not the photograph that has to be trusted, it’s the photographer. 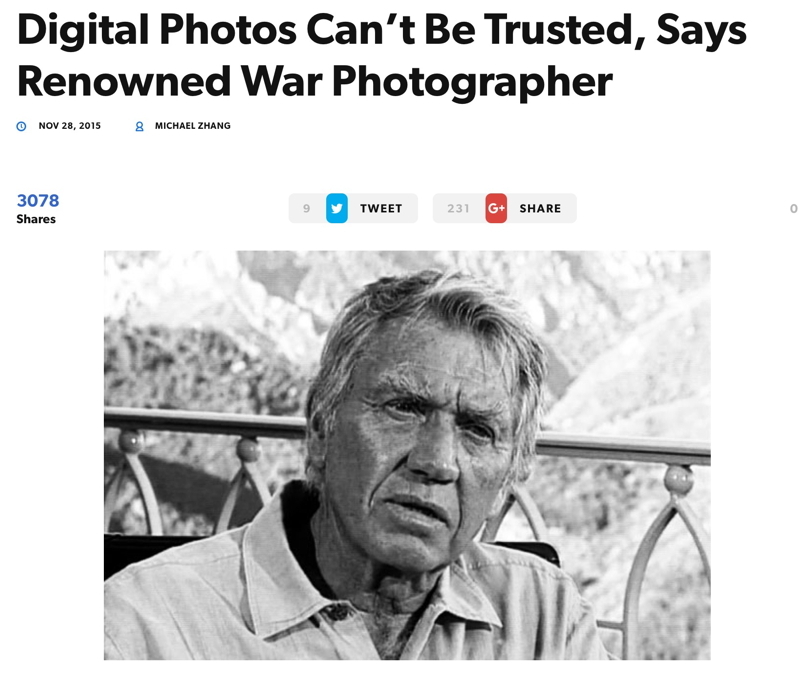 Following my post the other day on manipulated photographs by Steve McCurry, some thoughts on Don McCullin’s problems with digital photography. Another FFS moment on coming across comments from Don McCullin about the issues of digital cf film (zzzzz… sleep coming on). The problem is that people fetishize their own working version of whatever medium they are talking about, they forget the problems of previous versions of their craft and its alternatives, and believe that any particular instance of a “veracity problem” invalidates all other methods and uses of the medium. Firstly, there is no right way to do photography, just as there is no right way to do painting or writing or talking. Different people have different approaches and different outcomes. In the same way that I am not engaged by many of the genres of literature, but other people are, I am not engaged with many types of and subject matter of photography. I don’t read romantic fiction, very little science fiction and no war, horror or crime fiction. That doesn’t mean that there is no science, horror, war, romance or crime in the novels that I read, just that those subjects are not the main thrust of the stories told there. I find art that is purely conceptual in terms of its examination of the navel of its own medium and the mental mechanics of it tedious and uninteresting. Some people, particularly those who are following an academic or curatorial career, find that those types of work can enhance their opportunities for developing their authority. A lot of it is the equivalent of angels on pinheads that the religious authorities used to agonise about. Secondly, if we think about photography as a way of telling stories, true or otherwise, about the actual or an imaginary world, then we have to compare the photographic method to those methods that came before. We could do the same for writing and speaking, the other main means of communication that we have. Before photography there was painting and drawing as visual media, as well as the plastic forms of sculpture. Were these endlessly criticised for being distortions of the truth because of the subjective creator and the mechanisms of the medium that they are using? No, and they are all now fetishised as “fine art” and endlessly examined for their true meanings and metaphoric content. What of writing – do we challenge everything that is written because of the subjective leanings of the writer? And of course, everything I say is always true isn’t it, because I always have a perfect viewpoint for what I see and memorise. No, of course I don’t. If others are to be convinced of the veracity of what I say or write, they have to know something about me, my reputations for not allowing myself to distort what I have seen and my mechanisms for ensuring that I have not been deceived myself by my point of view, either physical or mental. That thereby I can say something that is usefully accurate in known ways, and potentially inaccurate in known ways, so that we can benefit from the communication. Photography is no different. A great deal of the possible distortion is not in the darkroom or the computer software, it’s in the chosen or happenstance point of view, in the arrangement or not of the subject matter, the impact, in Heisenberg’s terms, of the viewer and her process on the thing viewed and recorded. Most photography up to the 1950’s was as much manipulated in the set up of the shot as in the darkroom. Even McCullin was guilty, though infrequently, of that. Classics where there is some question of this set up distortion of what we see in the final image are Lange’s Migrant Woman, Capa’s Dying Soldier and a lot of Bill Brandt’s social documentary work. All makers and creators have their own working practices and also their own agendas, explicit and implicit. Knowing the people, their working practices and the mechanics of the medium well enables us to take those factors into account when assessing and using what they communicate. And thus we can take something of value from their communication rather than just pointing out that all media and communications are distorted by the means and the motive of the creator and presenter, and therefore of no value. And so to the question of the response to the tsunami of imagery that digital photography allows, and whether that undermines all communication through photography. Well, that is no different to the tsunami of digital news headlines or points of view or blogs or writing of any kind. We have to develop practices that are reputation and filter based to help assess the likely challenges to the material from various possible distortions that it contains. We are already doing that. We restrict incoming content to known sources, whether personal contacts or organisations attempting to get our attention. We filter in varying ways. I take no notice of material from the Daily Mail – I expect it to be so distorted by a frame of reference that I do not credit it with validity, that I see no point in engaging with it at all. I do not “friend” people in facebook that I have not had some interaction with or some common contacts. The same on LinkedIn etc., etc. These are the same sorts of mechanism that we might have employed before the ages of writing, before printing, before the digital age. When all we had was verbal – gossip and sermons essentially, and used reputational and cross comparison mechanisms for assessing the value of what we heard. The same must apply as we build the reputation and channel credibilities of the sources of the communications that we attend to and find useful in our lives today, including digital photography. (I originally wrote this back in November when the Guardian published their article, but didn’t post it until now). How many differences can you see children? Well, there are 9 that I saw, aside from the significant changes of contrast and saturation. So how do I feel about this Steve McCurry photograph that has been significantly edited to enhance its composition and engagement? What are the implications for me in responding to McCurry’s work and more generally in the continuing debates about altered photographic images? There is no question that it is a stronger image with the changes. Also that the meanings and messages are not particularly compromised, and the questions of why there are two people riding (actually four) and one pushing, and why the hood is not in use despite the rain, remain unaltered. Edited, it’s a nicer, more engaging image. More marketable no doubt. The original has some mildly interesting documentary aspects. The amended image is less documentary and more visually appealing – less informative than decorative. 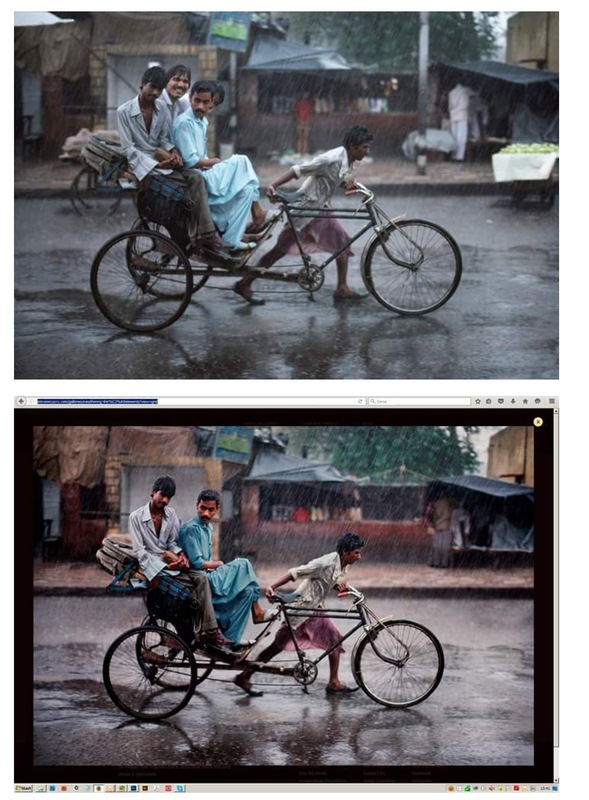 This is a general issue that some people have with Steve McCurry’s imagery, whether photoshopped or not. That they are very carefully composed, almost “staged”, for a particular version of the world. In individual cases it may not matter. No-one is demeaned or affected by the use of the revised image. It is not regarded as important evidence of anything. In terms of a view of the world that is represented by his body of work, or particular series, subsets, of his oevre, I am afraid that I distance myself from it. I have always had a mild suspicion of it. Now, the petapixel article clearly states that McCurry regrets that the changes have been made to certain images, and that they have been altered “by his studio” without his personal intervention. But what this says very clearly to me is that there actually is a McCurry view of the world, which is targeted at his commercial customers and audiences, and that his staff were ensuring that his images met this objective stylistically. That they were recognisably “McCurry” images, that they were suitable for his audiences. But do we need to enhance, simplify, saturate our world in order to experience it as interesting, beautiful, wonderful and worthy of our engagement? My question is less about the truth of an image to what was before the photographer when he pressed the shutter, than of what the processing says about how we see the world, as mediated by the commentators and media through which we get a great deal of our information about the world on a daily basis. It’s not just about the likes of HDR and other techniques, which may also make an image more visually strong and appealing, but are not what the world is about. I hate HDR as crass and gauche, I enjoy the world as it is. I don’t need in-yer-face visual enhancement and strong compositional technique to engage with or enjoy an image, its subject, meanings and messages. I don’t even want less obvious, but more subtle interventions in the images. Some people do apparently. There is a market for that, but not one that I am part of. I have what a lot of people consider a large collection of photobooks, but there isn’t a McCurry book in there. So I will continue to see Steve McCurry’s images as slightly suspect and be wary about the emotive and visual responses that I may have to them, being aware that they are “McCurry” images as much as what their subject is about, whether they have been heavily edited or not. Please donate so you can get one of the great rewards and join us at the exhibition opening for a glass of wine. Below – one of my images from the series “ex terra opes – evidence of civilisation”, in the show. Some of the books that I have acquired in 2014; not that have been first published in 2014; not just by photographers under 30 years old or their first publications or massive sellers or sold out before they were published or that I have a box of in the back room that is appreciating in value nicely or that I have for sale. This cannot be a list of the greats or the best or anything like that, because, like most of us, I don’t have the budget to buy everything that is hyped and hoped, or have every photobook sent to me like I’m the British Library, or even have the time to look at them all online. Just what I’ve come across and found interesting, inspiring or intriguing, and had the budget and the inclination at the time to get for myself. Now what is the point of this list? To show how I am both up with the in-crowd, the photoglitterati, but have a mind of my own? 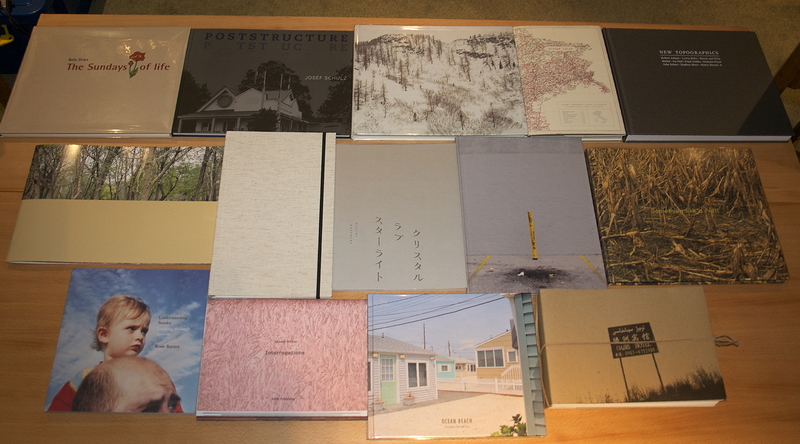 To tell you about some photobooks that have given me interest and/or an emotional response? Or to get your attention to present what I think is of value, as opposed to being just popular and at the cutting edge of contemporary photography’s curator/guru crowd world? No, it’s just a way for me to re-kickstart my blog and get myself writing. To have a chance to sound off about all the endless list making, competition winning, celebrity focussed memes and tropes that are out there, and have increasingly made photobooks a game for the photorati, deep pocketed or gatekeepers in the structure of authority that is the photography world nowadays. I hope that you will find something of interest here that you hadn’t considered before. They should all be findable on the usual book dealer websites or search engines for the self-published ones. Happy Holidays with your chosen books! Mitra Tabrizian Home/Land project, Belton Road, Loughborough. (though this link may well not last beyond this month). Today I went to the talk by Mitra Tabrizian about her piece (she also spoke about other work she has done over the past few years), and in preparing myself for this I visited the installations in Loughborough and made my own record of them (see one installation above). Now before commenting further I must declare an interest, which was perhaps what prompted my to give up my lunchtime. I am currently working on a project on the industrial heritage in the landscape of the area of Leicestershire where Loughborough lies. So I wanted to see someone else’s response to the place and the issues. In the past I have not been a fan of constructed images in photography, most of which I find to be fictions that are uninteresting. I do not believe that all photography is a fiction, or that it is all distorted by the photographer’s selections and choices. However, I do seem to engage with and enjoy installations of photography in public spaces, particularly by the use of billboards, not least because it provides an antidote to the endless banality of advertising. Each image is the scene of a former factory, one a men’s clothing manufacturer, the other a crane builder, each with an attendant figure, small in the former industrial landscape. The people in the images did not work at the particular companies, but I found that I really would have liked them to be former workers at the particular places, which would, I think, have produced a more visceral reaction to the sense of abandonment and isolation that Tabrizian says that she seeks to convey. The two people in the installation images were workers at other factories that have also gone; one a local man who is now documenting the history of his factory, the other an immigrant of Indian origin from Zimbabwe (so with a background of previous migration and dislocation). 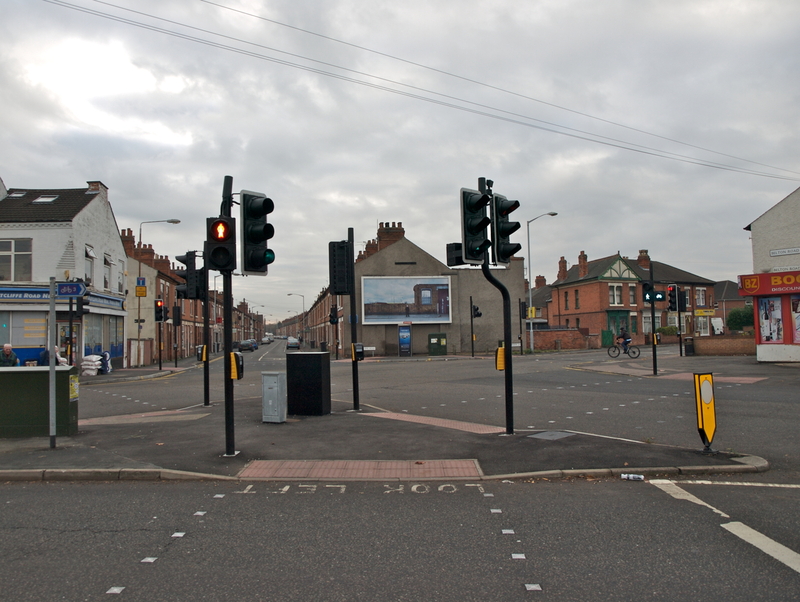 There are more images that have been made, particularly in Leicester, some without workers and some with young unemployed people. I think that these worked less well than the ones with the older former factory workers. There is a palpable sense of the abandonment and isolation that all workers must feel when the place that they have dedicated years of their lives to closes down and is wiped from the face of the earth, as these places surely will be. The workers are lost, without a compass, in the sort of place where they had some use, importance and value. Their contribution to the production and economic success of the local community is therefore ignored and the evidence of it is being eradicated. That is the way that capitalism works. However, I am not so sure that there is any more of this sense of abandonment and loss in the images because the worker was a migrant, rather than an indigenous resident. To me the installation above works well in presenting the issue in the context of the relentless capitalist agenda alongside an industrial estate, whereas the one below contextualises the concerns in a location where the displaced workers might be living now – the old Victorian terraced housing areas of a type now dominated by the immigrant communities in Loughborough and Leicester. 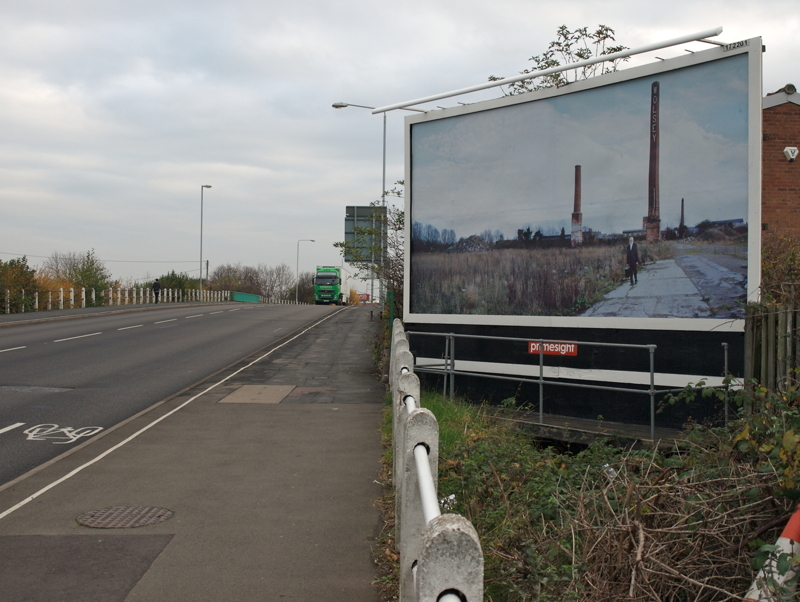 Mitra Tabrizian, Home/Land project, Ratcliffe Road, Loughborough. Tabrizian claims that the work asks questions without providing answers and creates a sense of ambiguity. I am not so sure. As a commentary on the capitalist process and its effect on people the piece is unambiguous. The implied answer has to be a combination of restrictions on the way that corporations use people and their lives dedicated to the good of the corporate owners and managers, the ways that we recognise and remember the contribution by workers to economic success, and the improvement of processes for transitioning people into new opportunities for themselves and the community. For, as US Senator Elizabeth Warren has said so clearly “You didn’t build that on your own”, referring to the essential community and government support for all economic enterprise, there is surely a responsibility to pay back and support the people that the entrepreneurial enterprise uses and who have contributed their lives to its success.